Protect your beautiful body with honey, royal jelly, propolis and more! Beauty Products There are 19 products. This Organic Anti-Aging Serum concentrates the best-known natural anti-aging ingredients. It penetrates rapidly thanks to its exceptionally thin texture. Composed of more than 80% organic ingredients, the serum releases its full action on the skin and all in an airless bottle. Our Organic Body lotion with propolis, shea butter has been specially formulated to thoroughly moisturize all skin types - even the driest! It combines the delightful scent of cotton flower with the reparative and moisturizing properties of propolis and shea butter. With a soft, floral scent, this Organic Day Cream has a texture of infinite softness that will give normal skin all of the benefits of its rich natural ingredients, including beeswax, orange blossom and shea butter. Finally, an Organic Eye lifting anti-aging serum that rejuvenates the skin around the eyes, reduces lines, wrinkles and dark circles. The roll-on applicator is easy to carry for a quick touch-up! Organic Honey and Bamboo shampoo pumps up your hair and the gentle formula make it supple, moisturized and silky. A natural pleasure, with bright citric and floral notes that won't sting your eyes! Voted Best Organic Product of 2015! Rediscover your skin Finish off your day - Rich in Vitamin E and active moisturizing ingredients, this cream for normal skin combines the regenerating powers of Jojoba and Avocado oils with the antioxidants of Royal Jelly for beautiful skin that will glow when you wake up in the morning. With a new formula, our Organic Propolis, Aloe Vera and Apricot Facial Scrub provides your skin with the gentle, cleansing effects of Propolis and Aloe Vera. Tiny exfoliating particles allow it to effectively remove dead skin cells and impurities, leaving your skin with a healthy glow. 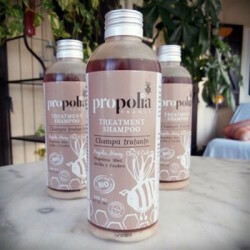 Organic Propolis, Honey and Clay shampoo, ideal for making hair healthy and strong. Formulated for normal to greasy hair, the active ingredients provide an anti-dandruff solution at a low of pH (5.5). Specially blended to provide cool, penetrating relief in muscle tissues, Propolis and Sesame Massage Cream also provides therapeutic relief for congested respiratory tracts. Made with organic ingredients of Propolis, Sesame, Sunflower, Lavender and essential oils, it contains no artificial colors or preservatives. A truly unique product, our Organic Personal Hygiene bath gel with Propolis, Tea Tree and Chamomile is adapted to your body's Ph balance for the cleansing and purifying effectiveness of Tea Tree and Propolis.